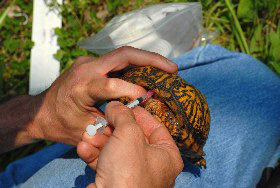 Blood sample from box turtle for disease monitoring. Photo by Lori Erb. The purpose of the amphibian and reptile diseases working group is to provide information on disease prevalence, monitoring and prevention in reptile and amphibian populations in the northeast region. We are currently focusing on improving communications among people working with amphibians and reptiles with an emphasis on how to safeguard populations from disease. If you are interested in joining the Emerging Diseases Working Group, email Jim Julian.